Video gallery | "Fund family Kolhofer"
Instrument by Antonio Vivaldi and Niccolo Paganini. The violin is so mysterious and charming. She easily transmits sadness and despair, and for several notes she can lift up to heaven. This year, the young violinists of Ukraine took part in the grand music festival "Pro-Art 2018" held in Khmelnytsky regional philharmonic society. Cinematography, radio, television - all this has become an integral part of the life of any person. However, before the advent of modern technologies, the society invented the way of entertainment, and at the same time the opportunity to develop is a theater. Comedies, drama, political satire - what is familiar to everyone, is embodied in front of the viewer livefully, conveying all the excitement and joy. 26 best drawings in the 26th anniversary of Independence of Ukraine. So, in 2017, the Charitable Foundation Kolmogaler Family Fund summed up the results of a good, bright and honest children's drawing contest. The winners received valuable prizes, and the work of all the participants, which, by the way, was almost 3 thousand, created a canvas with contours of the state. With the efforts of children and organizers there was another post in the Book of Records of Ukraine. And with his singing, the creative little Zlata Ognevich was happy. Philanthropists are not going to fill up the pace of such activity, and they have already begun receiving work-2018. Future actors of the theater and cinema, artists who are only at the start of their creative journey. They sang, danced, recited verses and showed parodies - all in order to get to the "The First Theater Academy." For the Khmelnytskyi children have a real casting. And the jury included recognized experts in theatrical art, which almost at first glance can understand the direction in which the child needs to move on. "La Minor" - perhaps the most famous composition of Myroslav Skoryk. This artwork was used in Ukrainian film ‘The Great Pass’ in 1981. And now the composition is one of the 10 most famous musical compositions of our time. In general, the maestro became a composer of more than 40 Ukrainian films. At one time his opera "Moses" received the blessing of John Paul II. Also, you can know him as the author of the first twist in Ukraine "Do not trick the lilies" and the vocal masterpiece "Draw me a night". 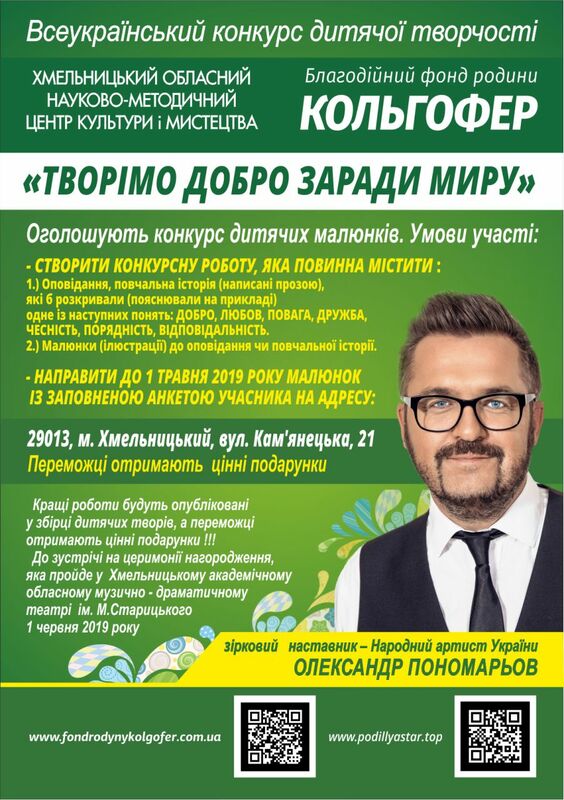 Now, the Hero of Ukraine, famous artist and musicologist has shown a new program in the style of "Jazz".